I’m going to make it simple: Start with what you have. The basics you need are (and this is just my opinion, FWIW, based on my own personal experience): A fit, sane, sound horse; a saddle that fits your horse and yourself; a tack set-up that fits and offers control; a way to carry water/snacks for yourself; a way to get to/from the ride. 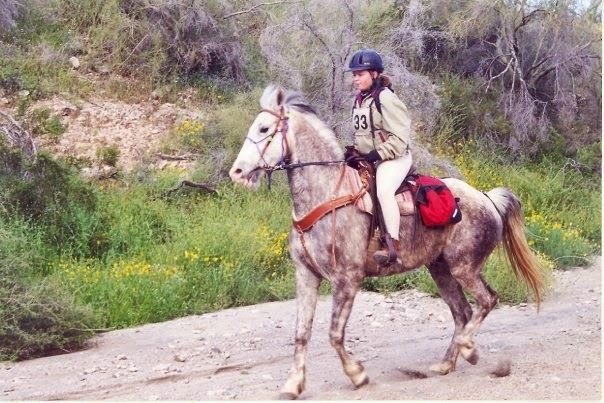 The Horse: Yes, Arabians are the most popular breed in endurance. They excel at long distance in that they have been bred, physically and metabolically, for this sport. That doesn’t mean other breeds can’t do distance. The record for highest number of Tevis completions is held by a Quarter Horse. Start with what you have, as long as they are fit, sound, and sane. Some breeds may need more, or different, conditioning than an Arabian. I would not recommend starting out with a horse with known physical or metabolic issues; distance riding is a challenge and managing a horse with known issues puts you behind the curve and makes it that much harder. But you also don’t know what your horse can and can’t do until you ask. 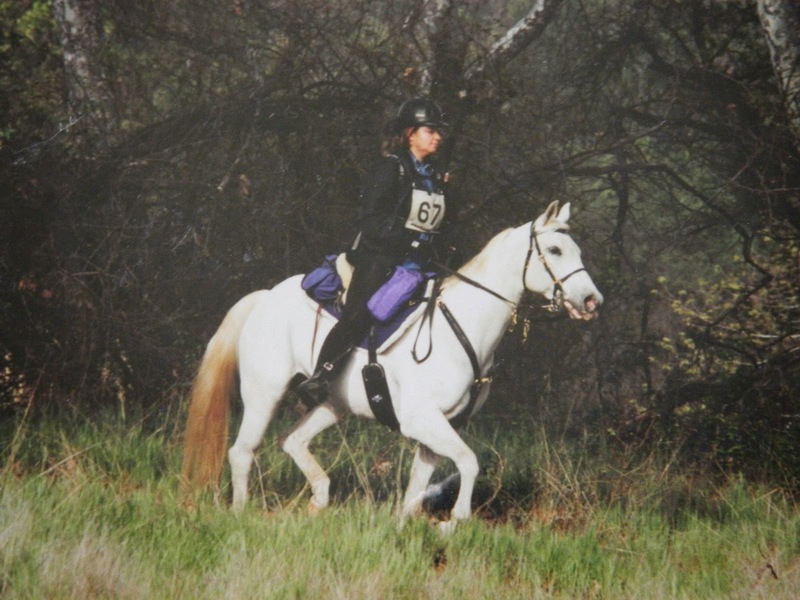 I never imagined my show pony would could ever be a safe trail horse, let alone compete in distance riding. She proved me wrong. Ultimately, age and prior use caught up to her and ended her distance career far earlier than either of us were ready for; but she did me proud and I have no complaints. Mimi may look like a little grey Arabian mare, but she’s a registered Pony Of the Americas (POA) with a POA sire, and full QH dam. The Saddle: If what you’re riding in works, start with that. There’s no reason to rush out and spend money on a new saddle — again, for a sport you may or may not like — if what you are currently using fits you and the horse and is comfortable. There’s a good chance your horse’s body shape may change as he gets fitted up, and you may need to saddle shop at that point, but there’s no point in spending the money before you have to. Or you may discover that your saddle that is great for a couple of hours isn’t so great after 25 miles, but don’t assume the worst right away. 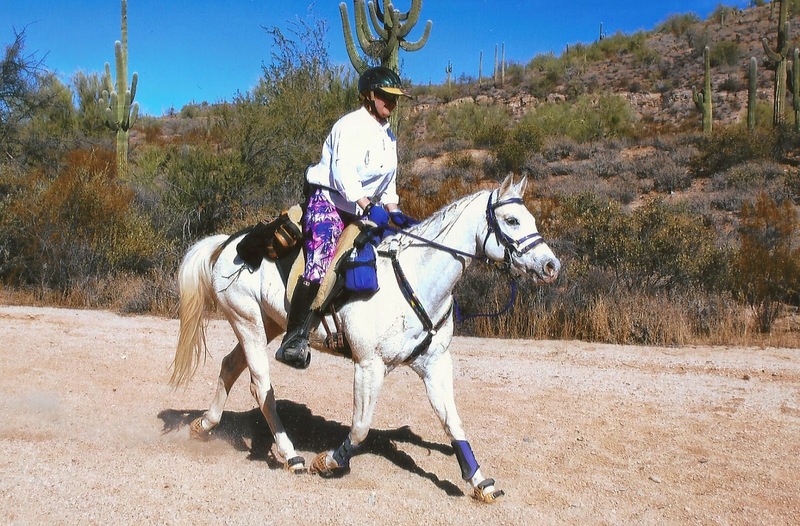 I started distance riding in my gymkhana saddle: a cordura Big Horn. It fit Mimi, it was comfortable enough for me, it was secure, and I could attach gear to it. After I stopped showing, I sawed the horn off the saddle so I would quit poking my ribs into it on uphills, but I ultimately used that saddle off-and-on all through my distance career with Mimi, and I still have it as a back-up saddle. If you do end up saddle shopping, network around — if someone near you has a style you’re curious about, ask to sit in it or try it out. (I’ve been able to try more saddles that way and figure out if I like them or not.) There is also an extensive used tack network that exists in the endurance world, since we’ve all been or are in the process of being in the saddle shopping boat. But if you’ve been logging saddle time and conditioning miles in your current set-up and it’s working, stick with that, at least through your first couple of rides. Other Tack: See above — start with what’s been working. The bright colors and matching tack is so tempting…and also not cheap. We all want to look good, especially when showing up to something new…but my advice would be to give it a few rides before splurging at the distance supply stores. All you really need is a halter/lead to tie with, a bridle that offers solid communication and control, and if you’re going to be doing hills and have a saddle that potentially slips back, a breastcollar (or a crupper if it slips forward). I came out of the show ring, so most of my tack was leather, and some of it even silver-encrusted. Leather, although it smells wonderful and feels even better, generally doesn’t do well in the salt-and-water-heavy endurance environment. In other words, you’re going to spend as much time cleaning your tack as riding, if you don’t want it to wear prematurely and weaken. I did have my day-to-day nylon training gear, and that’s what I started with for conditioning gear. I will say that if you’re coming out of a very different background (show ring, just for example), you may not have some of the necessary gear: like I didn’t have a breastcollar, and Mimi’s size difference meant the spare one my dad had for his horse really didn’t fit…so I did have to buy that. But if you’re going to have to buy something, search that used tack network. It helps if you’re flexible on color, or start with a basic black. I know how much fun it is to try to decide what color is going to look the best on your horse — believe me, I still like doing that — but I would recommend holding off on spending money until you decide this really is the sport for yourself and your horse. paddock boots were what I used for schooling. Water/Snack/Gear Carrier: For anything over 20 miles, you’ll probably want some way to carry water and snacks for yourself, as well as a small on-trail kit (small first aid kit, bandanna, vet wrap, cactus comb if you’re in the desert, carrots). This could be in the form of carrying it on your person, such as a Camelbak, or some kind of saddle packs. Endurance-specific saddle packs are designed to be bounce-free and low-profile, but some snaps and baling twine can secure standard saddle bags down in a pinch (I didn’t know any better, so that’s what I used on my first distance ride). Transportation: Most rides tend to be a distance from where people live, so driving there is a necessity. If you have your own vehicle/trailer, you’re all set. Work with your horse so that they tie comfortably to the side of the trailer, have a bucket for water and some sort of hay delivery/containment method, and you’ll be set. Once you decide this is the sport for you and your horse, you can explore other equine-containment systems such as high ties or portable corrals. (I hard-tied Mimi off to the side of the trailer for a number of years with no problems, and some experienced endurance people still prefer this method as one of the safest and most secure methods; since they have less space to move, you just may need to hand-walk them a bit more often. If you are truck-or-trailer-less, there is still a way. Back to that good old networking thing: see if someone around you may be willing to trailer-pool to the ride. 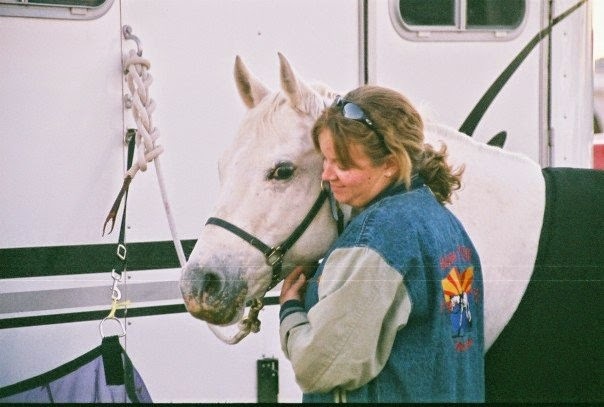 If you find someone willing to share their ride with you, it’s nice to: offer to split travel expenses, have a horse who is a well-mannered traveler (why I actually don’t like trailer-pooling in other people’s rigs: Mimi kicks, and has scuffed or torn up a number of rubber wall mats), be ready in a timely fashion, and be organized and have all of your stuff condensed together as much as possible. Because my dad and I did all of our rides together, we were our own “trailer-pooling” entity, but I’ve also done some rig-sharing when riding other people’s horses, and it can be a lot of fun. Good company makes a (sometimes long, boring) drive go by a lot faster (and it’s nice to have a free set of hands to raid the cooler, and open bags and water bottles), and two sets of hands make camp set-up go smoother and faster as well. 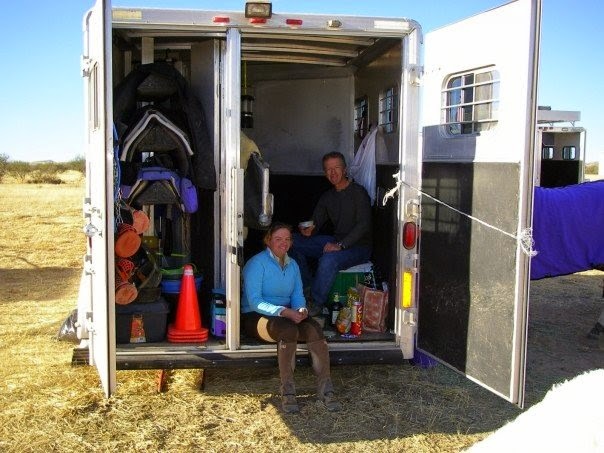 You also don’t need a fancy living quarters trailer to do this sport: for years, we successfully used a 2-horse slant-load trailer, and a combination of the dressing room, back of the trailer, or back of the SUV for sleeping arrangements. Yes, living quarters are a nice luxury — but there are a lot of people who still pitch a tent. You will see all sort of set-ups at a ridecamp; everyone figures out what works for them, their budget, and their camp needs. Before I eventually got a Hi-Tie, Mimi successfully hard-tied to the trailer for years. tack compartment and the front dressing room. The biggest “takeaway” advice I have to give is that really, there is very little out there that is a “right” way or “wrong” way if the end result is a fit, sane, sound, comfortable endurance horse, and a comfortable rider. It’s the ultimate in “just because everybody else (or what seems to be like everybody else) does it, doesn’t mean you have to.” Sometimes there is a reason for the popularity of something (like the sturdiness and ease of cleanup of biothane tack), but it never hurts to ask why and the reasoning behind a particular action.